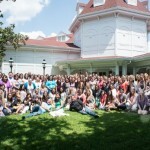 School is now in session! 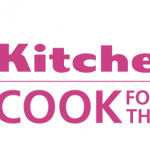 But it’s time to put down those pencils and pick up your KitchenAid® Chef’s Knife as you sharpen up on the five essential knife skills every cook should know. Ready to chop, slice, dice, julienne and chiffonade like a pro? Check out my essential tips below then read on for step-by-step tutorials for each knife skill. Avoid the Slip and Slide: Secure your cutting board to your work surface by wetting a paper towel or kitchen towel and placing it underneath your cutting board. 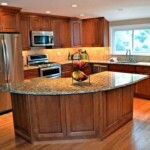 This prohibits your cutting board from sliding around on the counter and helps ensure safety. The sharper your knife, the less chance for injury. It may seem counterintuitive, but a sharp knife leaves less room for error, as it will quickly and cleanly slice through foods while a dull knife will require more force and pressure to make the same cut. It’s important to hold the knife with your thumb and index finger gripping the top portion of the blade, rather than the handle. This will allow your hand to control the motion of the blade. A long blade, such as the one shown above, can be hard to maneuver if you aren’t gripping it properly. Secure your grip atop the blade and take full control of where and how quickly the blade moves. With your grip in place, it’s time to pay attention to your other hand, which is what will be holding the food in place as you cut it. And this is when it’s time to tuck those knuckles! Loosely bend your fingers so that the tips fold underneath the palm of your hand. The blade of the knife should now run down the flat part of your fingers (right below your knuckles), which keeps the tips of your fingers out of harms way. Chopping is the easiest and least technical of the five essential knife skills. When a recipe calls for an ingredient to be “chopped” or “roughly chopped” it can refer to a variety of outcomes, but in general, chopping refers to cutting an ingredient into smaller pieces that are larger than what results from mincing (very fine chopping). 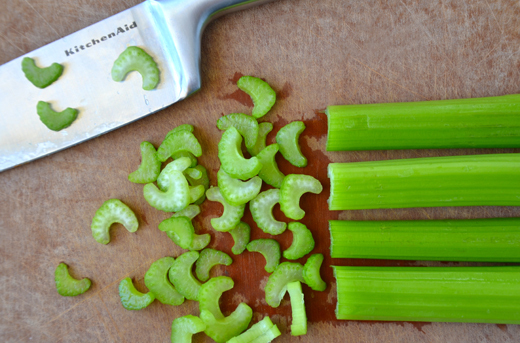 To chop an ingredient such as celery, grip your knife and then quickly run it through the celery stalks to cut them into smaller pieces. 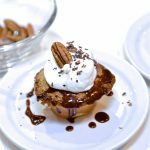 Depending on what your recipe requires, you may want to run the knife through the celery a second time to coarsely chop it into smaller pieces. 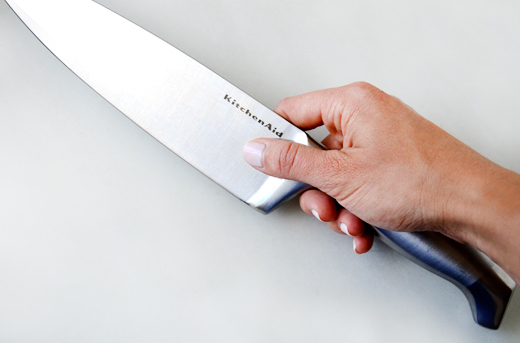 Remember to maintain a relatively loose grip on the knife so that the blade can chop the food in a fast, fluid motion. 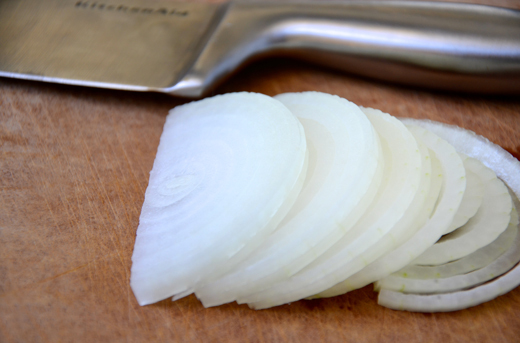 Slicing requires a bit more precision than chopping, especially when it comes to an ingredient such as onions. 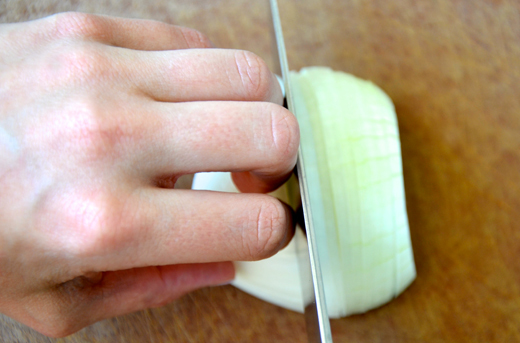 Slice the tip off the onion, then slice just enough off of the root so that the onion layers remain intact. Next, slice the onion in half through the root. With your finger tips tucked securely against the palm of your hand, run the knife down through the onion to form slices. Repeat the slicing motion until you reach the end of the onion then discard the root or save it for vegetable stock. Dicing is the most precise of the first three knife skills and refers to cubing a food into a specific size. Recipes often reference “small dice,” “medium dice” or “large dice” in the ingredient list to dictate the required size. Accurate dicing requires an approach that begins by squaring off the food. 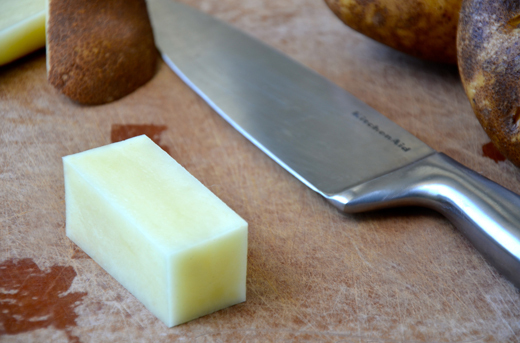 For example, if you are dicing potatoes and carrots, you first slice off all sides of the ingredient until it is a rectangular box. 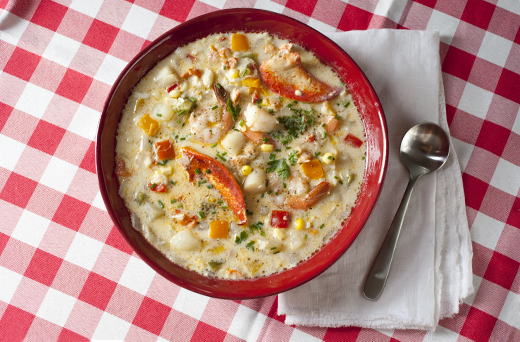 Discard the scraps or save them for snacking or vegetable stock. Once the food has been squared off, it’s then sliced into thinner sheets. The sheets are then cut into batons and the batons are cut into dice. 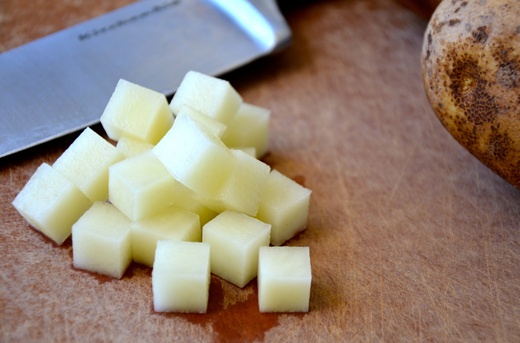 The goal with accurate dicing is to produce cubes of all the same size so that they will cook at the same rate. 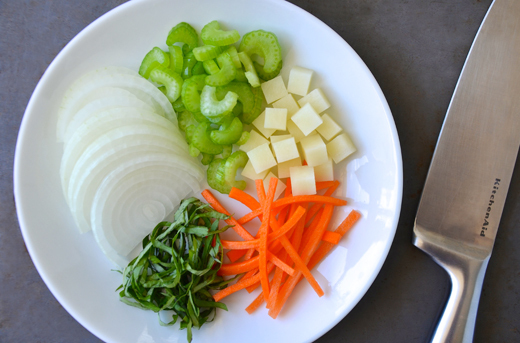 To julienne a food involves slicing it into thin matchsticks, which are often used in salads and stir-fried dishes or as a garnish. 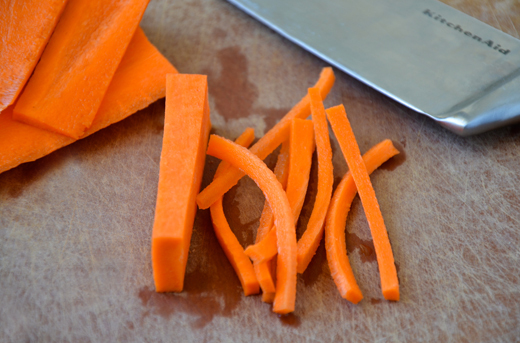 The technique to julienne a food has a similar approach as dicing in that you begin by squaring off the food so that it has all flat edges. Next, you slice the food into thin sheets then each sheet into matchsticks. It is important to begin with as accurate of a rectangular block as possible, as this will ensure that each matchstick is even in shape and size. Last, but definitely not least in the lineup of five essential knife skills to know is chiffonade. To chiffonade an ingredient refers to cutting it into thin ribbons, which are often used in salads or as a garnish. 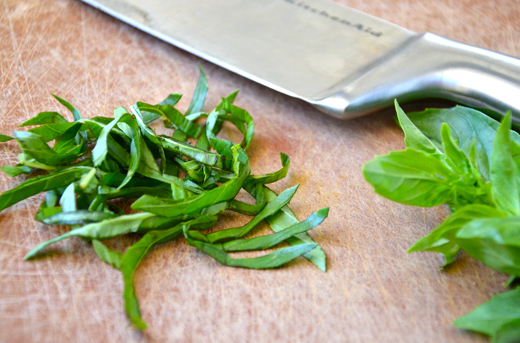 To chiffonade fresh herbs such as basil or mint, simply stack four or five leaves atop one another then roll the leaves up into a tight bundle. Holding the bundle securely on your cutting board, quickly run your knife through the roll then use your fingers to separate the herbs into ribbons.